Dorset winters are typically mild and can be very dull and damp so the heavy fall of snow was a welcome change and transformed the countryside. The fresh fall of snow coincided with a shoot day on the shoot where Poppy and I beat. After battling through the fresh snow to get to the shoot we finally arrived in a very white yard to assemble for the days activities. There were the expected no shows but everyone present was looking forward to a good day in the wintry conditions. One of the beaters, Richard, even skied 6 miles to get there! After our briefing it was off to the transport to the first drive. There is absolutely no sign of civilisation around the drives making the scenery all the more impressive. 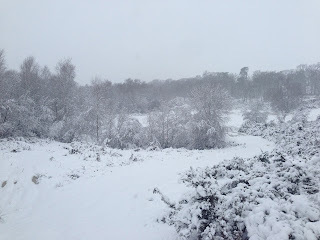 As the morning progressed the snow continued to fall, heavily at times. 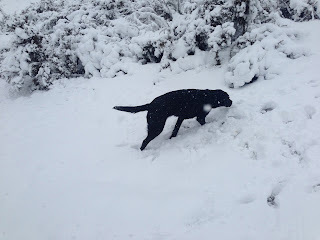 This was the first time Poppy had seen any snow so she was very excited and not particularly well behaved. Being in Dorset I wouldn't anticipate this being a major problem. After five drives the day was over and and a fair few of us felt exhausted but a respectable, mixed bag had been shot. The spectacular scenery and great company, as always, made it well worth the effort!